Twitter is teaming up with Burberry to test its first 'Buy' button for brands on its platform, to allow users to shop directly from the site. The microblogging site is following Facebook’s lead by testing the button with a select group of artists and brands in the US, including fashion brand Burberry, the US home store, Home Depot, music artist Pharrell Williams and rapping superstar Eminem. 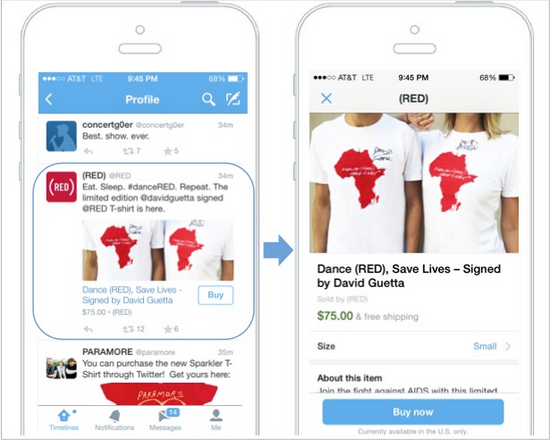 Users will get access to offers and products they can’t get elsewhere by using the Twitter app for Android and iOS. Users will be able to complete the entire purchase by using the ‘Buy’ button. They will also be served additional product information and be prompted to enter their shipping and payment information. Once that is entered and confirmed, the order information is sent to the merchant for delivery. Twitter has said it has built the button with security at the forefront. Payment and shipping information will be encrypted and safely stored after the user's first transaction, so they will not have to re-enter their information after every purchase.